It has been a hectic few weeks for us here at Ballymaloe Foods! With the Ballymaloe Literary Festival, Sheridan’s Cheesemonger Festival, Café Javas charity fun day and Bloom in the Park we have certainly been kept busy. This year was our first time participating at Sheridan’s Cheesemongers Food Festival in Co. Meath. This wonderful event took place on Sunday 24th May where some of Ireland’s top food producers gathered in the heart of the country to meet people from all walks of life. There was plenty of entertainment for young and old including the brilliant National Brown Bread competition – Maria O’ Reilly was a very worthy winner! 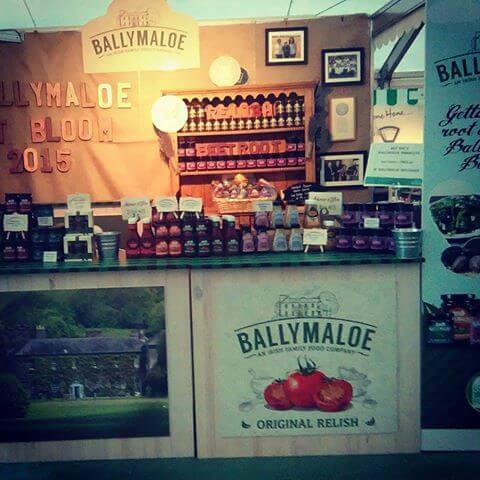 Ballymaloe Relish pulled it out of the bag Sunday 24th May by managing to be in two places at the one time ! Café Java’s annual charity cycle and family fun day took place again this year in the picturesque town of Sandymount, Co. Dublin. This is an amazing event with over €100,000 raised for St. Vincent de Paul and Aware Ireland. Ballymaloe were there to serve lovely samples for all those who took part in the day. The biggest and the best was saved until last with Bloom in the Park. This annual event in Phoenix Park, Dublin spanned over five days of the Bank Holiday weekend. As one of the highlights of a gardening enthusiasts year, Bloom is a spectacular event which caters for the novice gardener to the expert as well as any children with an interest in getting green fingers. The show gardens were particularly amazing this year. Winner of the Large garden category, Our origin is green designed by Jane Mc Corkell highlighted all there is to love about Ireland’s past, present and future. Ballymaloe Foods was based in the Love Irish Food tent amongst many other amazing producers such as Kinsale Gourmet, Dairymaid, Big Al’s and many more! Tastings of our delicious new pickled beetroot and pasta sauces went down a treat and the jars of Ballymaloe Original Country Relish flew out the door. We would like to thank everyone who visited our stand. We thoroughly enjoyed chatting with everyone, despite the rain and gusty wind that prevailed most of the weekend! Over 90,000 people visited Bloom in the Park this year. We hope that everyone enjoyed their day out and we look forward to seeing you all there again next year!